When did you attend the AVM program, and which age level(s) did you attend? I attended Adult AVM program in May 2015. At the time, I was 25 years old and working in human clinical research at a medical school, and my background was in public health. What did you like most about the AVM program? I think my favorite part about the AVM program was that I didn’t feel pressured to apply to veterinary school—it didn’t feel like I was being sold on the idea of becoming a veterinarian. 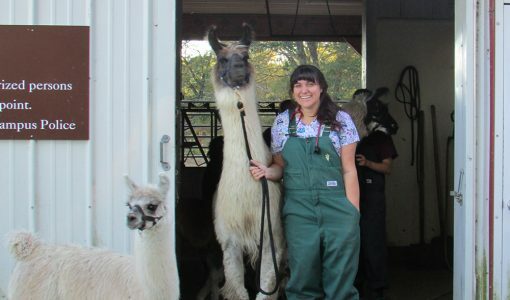 It felt more like an exploration of what opportunities are available in vet med and it gave me, as a city girl, the opportunity to experience large animals in a way I never had before. It really felt like a vacation from my job at the time and gave me exposure to so many new things. What are your favorite memories from your AVM experience(s)? It’s been a few years so the memories aren’t totally fresh in my mind. 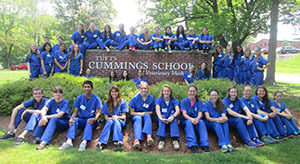 I remember the experience as a whole being very comfortable, and I remember completely falling in the love with the Tufts campus. I also remember enjoying the experience of handling farm animals, which is something I had never done before. Everyone on the campus was so welcoming and open to answering questions, and that was also really great. How did AVM prepare you for veterinary school or help you in your exploration of veterinary medicine? At the time, I had been considering applying to veterinary school but it almost seemed like more of a pipe dream than a realistic goal. AVM gave me the confidence and the needed ‘push’ to leave my job and work in a small animal practice for a year to get the necessary experience to finally apply. The week I spent here made me sure that I wanted to pursue this path. I gave my boss my notice 2 weeks after I got back and began working full time in a small animal practice about 2 months later. Is there anything else you’d like to share with potential AVM participants? Even if you aren’t planning on applying to veterinary school, AVM can still be an amazing experience. In my group, there was a medical doctor who decided to come just for fun and to learn about the differences and similarities between human and animal medicine. He had no intention of going back and earning another medical degree but he did learn a ton and enjoyed his week at Cummings School. Whether you are a middle school, high school, or college student, or even a “transitional” adult, Adventures in Veterinary Medicine has a session for you! If you’re bright and motivated, you’ll find no better introduction to a career in veterinary medicine. Learn more.